KING BILLY HAS A DOG! King Billy has a beautiful Kingdom with 200.000 and counting Citizens (including 472 Barons, 104 Dukes, 6 Princes and 3 Kings). King Billy also has 4 prestigious awards in his possession (AskGamblers 2018 Best New Casino, AskGamblers 2019 Best Casino 3rd place, AskGamblers 2019 Player’s Choice Casino 2nd place, iGB 2019 Best Casino Affiliate Program). And now, King Billy has a dog! 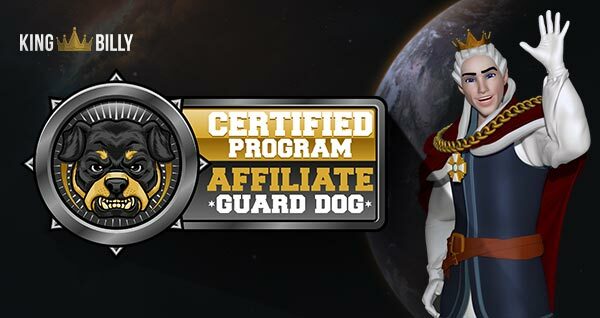 We are proud to announce to our players and affiliates that after a thorough audit, King Billy Casino has been granted the prestigious Affiliate Guard Dog Certification. What does this mean for our affiliates and their players? A lot! It guarantees, beyond doubt, what we set out to do, almost 2 years ago: to build a relationship with our affiliates based on full transparency and mutual trust. The King Billy Affiliate Department is proud on communication with its affiliates always in time and paying them always on time. Moreover, we strive to offer even more affiliate-friendly terms to our existing and new affiliates. Our terms and conditions are crystal clear and predatory practice or spam activity is forbidden in the Kingdom. This is why we keep getting awarded by the industry’s most esteemed institutions and loved by our 500+ affiliates. King Billy Casino. Loved, awarded, and now, certified!